As the days get warmer and the sun shines bright, exploring the city out in the fresh air becomes more appealing. Fortunately, one of the great things about Buenos Aires is that despite being a gigantic urban labyrinth, its streets are lined with lush trees and there are plenty a park and a place to explore outdoors. Parque 3 de Febrero: The lush extensive parks that were inaugurated in 1852 by caudillo Juan Manuel de Rosas are a city emblem. Between Av. Libertador and Lugones, and extending from Av. Casares in Palermo to La Pampa in Belgrano, this group of parks is composed of 25 hectares made up of 15 public parks and 21 private sport clubs. Some of the highlights for those getting to know the city include the “Rosedal”, an extensive rose garden with an Andalusian patio and a small lake to pedal boat in, the Sivori museum of art, the planetarium and the Japanese gardens which host a variety of activities related to Japanese culture. Recoleta parks and Cemetery: The Recoleta Cemetery is one of the most famous attractions of Buenos Aires and for good reason. Great political figures, scientists, writers and other important characters of the city are buried in this cemetery full of stories of broken hearts, love and hate, friendship, obsession, loyalty and ghosts. The architecture of the vaults is also pretty spectacular which is why it’s a must visit. Other attractions in the area include very extensive and lovely parks, museums, architectural gems and the famous Floralis Generica monument. Puerto Madero: Pierced by the river, this upscale area is lined with renovated warehouses that were turned into hip restaurants overlooking sailboats and bridges. Modern and upscale, it is a great place to walk through, and lunch in. The elegant Puente de la Mujer (woman’s bridge), and the Fragata de Libertad (a ship turned into a museum) are the main attractions of this carefully cared for area. Reserva Ecológica: Behind Puerto Madero is a unique ecosystem that naturally emerged from deposits of rubble used for the construction of a highway in the 70s and 80s. It has become a great place for bird watching within minutes of the city, and also has the best views of the city’s skyline. Guided tours of the reserve are available on weekends from 10.30am-3.30pm and a monthly nocturnal visit is conducted which you must book a week in advance for. More information on nocturnal tour dates here. Tigre: In the outskirts of the city, on the opposite side of town, is an island lined by small rivers and streams. The rugged location surrounded by nature offers a variety of attractions including canoeing, kayak and other excursions by boat, trekking, ecotourism, motorboat and commuter boats to take you to different places on the riverside, restaurants, spas, tea-houses, picnic sites, a naval museum, an art museum, a mate museum, a casino, a crafts fair and an amusement park. More information here. 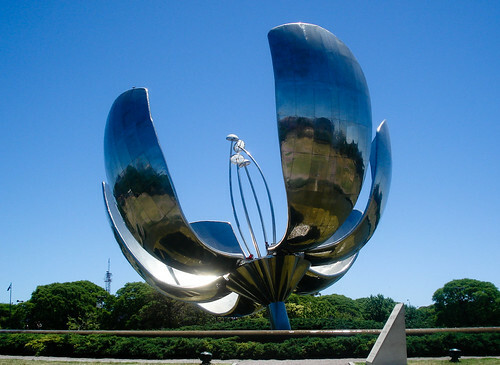 This entry was posted in Where to Go, What to Do and tagged attractions, Boats, buenos aires,, Ecological Reserve, Floralis Generica, outdoor, Palermo, Parks, pedal boats, Puerto Madero, recoleta, Recoleta Cemetery, river, Rose Garden, tigre by Fierro Hotel Staff. Bookmark the permalink.